Not as much terrorism, the political environment or government gridlock. Retirement plan participants are mostly focused on national issues that can directly impact their portfolios, according to new Spectrem Group research. Affluent investors overall, for example, are as concerned about the political environment as they are stock market conditions. 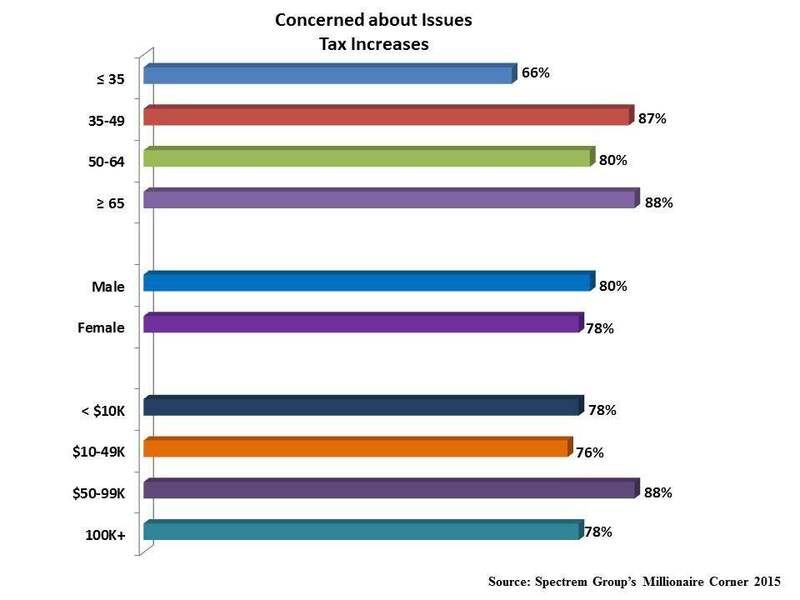 The highest percentage of retirement plan participants are concerned about tax increases (79 percent), up from 76 percent last year. Next come concerns about the political environment and the perception that the White House and Congress cannot or will not work together to solve the country’s economic problems, followed by concerns about stock market performance (69 percent and 67 percent, respectively). Nearly seven-in-ten retirement plan participants express concerns about inflation (68 percent) and the federal deficit (67 percent), while 65 percent fret about government gridlock as was witnessed recently with the grueling and contentious confirmation of Attorney General Loretta Lynch, which took five months. Just over six-in-ten retirement plan participants expressed concern about the national debt (64 percent) and low savings interest rates (63 percent), while 58 percent are concerned about when the Federal Reserve will raise interest rates and the impact on the stock market. Surprisingly, only 58 percent are concerned about terrorism, which is forefront in the news as ISIS continues its relentless campaign. This issue does hit closest to home for women plan participants more than their male counterparts (70 percent vs. 55 percent). Across age groups, the highest percentage of plan participants concerned about the federal deficit (76 percent) and the national debt (74 percent) are Baby Boomers ages 50-64. Gen Xers (73 percent) are most concerned about stock market performance, while seniors 65 and up express the most concern about low interest rates (78 percent), inflation (77 percent), and an increase in interest rates.